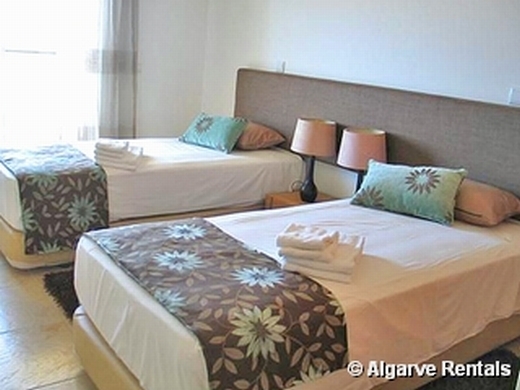 This self catering 2-bedroom Lagos apartment is in the perfect location for an Algarve beach holiday. 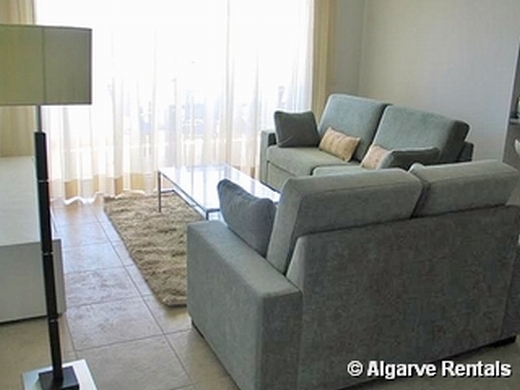 Just a 2-3 minute drive or 15 minute walk from the beautiful beach at Porto de Mós and 5 minute drive from the historic town of Lagos, which has restaurants, shops & character in abundance. Sleeping 4 to 6 the air conditioned west Algarve holiday rentals apartment is on the second floor of a two storey building with a lift and is furnished to a very high standard. 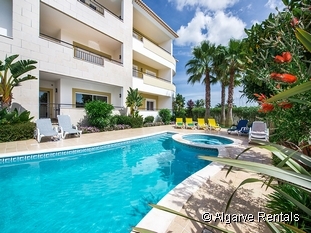 Perfect for a family holiday with two bedrooms and a double sofa bed, terraces, communal pool, air con, sat tv and the all important barbecue! There are lots of other beaches in the Lagos area and it is also just a short drive to the Algarve's lovely west coast surfing beaches & many golf courses. 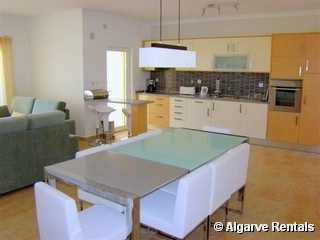 *This is just one of a selection of the many self catering apartments and villas in the Lagos & Western Algarve area offered by Algarve-Rentals - if you don't have time to browse just email or telephone now with your full requirements. This 2 bedroom apartment is priced for up to six people, as one of the sofas converts to a bed that can accommodate 2 young children or one older child or adult, making this a very cost effective apartment in a great location. On entering this Lagos rental apartment apartment you walk into a large open plan living room and dining room area with a compact but fully fitted kitchen on the right hand side. 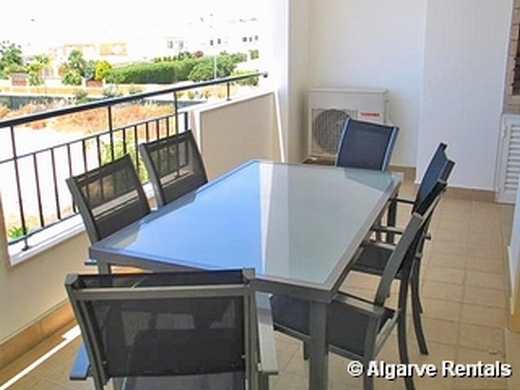 There is a large terrace off the lounge area, which also has access from the kitchen, and this has a built in barbecue plus table and chairs for that all-important al fresco dining. The living room has a TV and DVD/Stereo system. One of the sofas converts to a bed providing sleeping arrangements for 2 children or 1 adult (comfortably). The master bedroom has a double bed and is large and airy. This leads out to another large terrace with sun beds. There is also an en-suite bathroom, complete with a bath and shower. 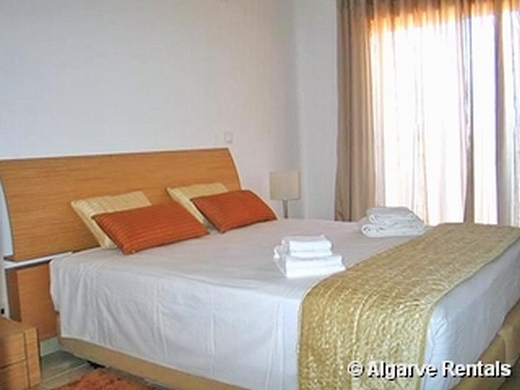 This bedroom also has access to the second terrace with the sun beds. 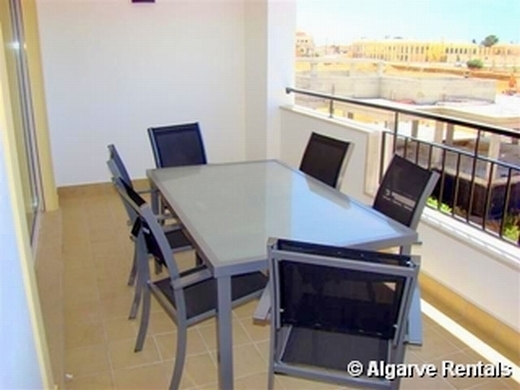 Both bedrooms have fitted wardrobes and the whole apartment is air conditioned. 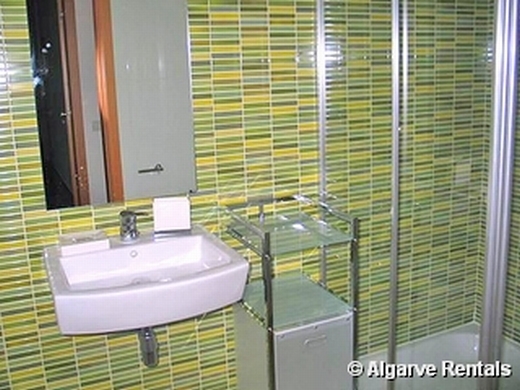 The bathroom tiles and fittings are modern and bright. There is large dining room table that can extend to seat six and the kitchen also has a small breakfast bar with stools for when you just want to grab a quick snack or coffee. 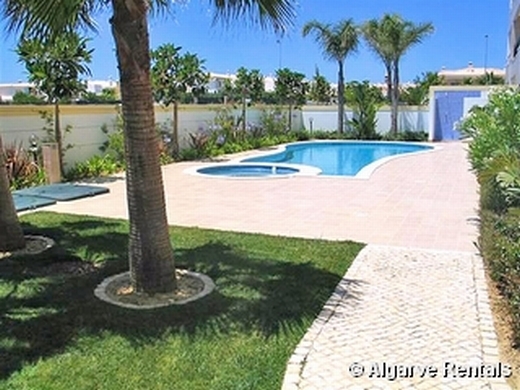 The shared swimming pool is accessed from a side gate and is surrounded by tiles and enclosed within a small mature garden. There is also a jacuzzi next to the pool. This apartment really has to be seen to be appreciated and is the ideal family property providing safe and comfortable surroundings in a brand new complex. Please note that this is a new development (2010) and although the location is indicated below on the Google map, the buildings do not yet show. One double en-suite bedroom plus a twin bedroom with adjacent bathroom. Sofa bed sleeping two children or one adults/older child. Tariff per week for up to 6 people sharing (max. 4 adults with 2 children, or 5 adults). Payment is by bank transfer in sterling or by credit/debit card in both sterling and euros. 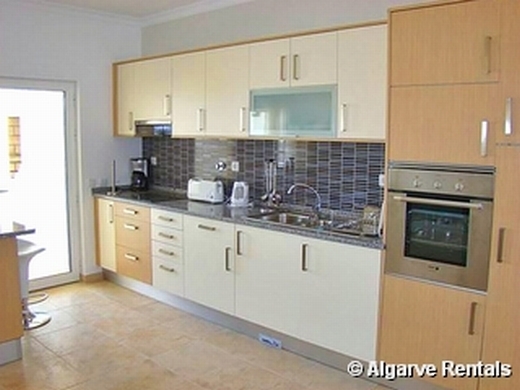 30 per cent deposit on booking and the balance 10 weeks before arrival. Full terms and conditions on booking.